Apparently some classes of creditor are treated differently from others when a football club goes bust, in unique and special footbally ways, and HMRC don't like that. They argued before a judge that "the most fundamental principle of insolvency law is that creditors share equally in a loss". That's odd, because 11 years ago this month when my employer went bust, HMRC were the first creditor to get paid, followed by (if anything was left) other businesses, with employees last. Naturally, I didn't get a penny of the £5000 that I'm owed - that's the month's salary in lieu of notice of the end of my employment, as laid out in my contract, plus two weeks salary not paid for time that I worked, plus a week's paid holiday I was entitled to. It seems that HMRC now think that's terribly unfair. I guess I need to send them an invoice. There were about 20 employees, plus maybe 10 corporate creditors, plus HMRC, so I estimate that I'm entitled to one part in thirty one of the company's assets, up to a maximum of £5000. Of course, HMRC have had my share of that for 11 years, so I need to also charge them interest. The Filth currently have an incredibly stupid poster campaign going on, encouraging people to waste police time and money by phoning their "anti-terrorist hotline" about nothing at all. Of course, the real objective is to keep the sheople scared so that the state can use the excuse of TERRRRRRRRRRRR to trample even more on our civil liberties. And if you want the much bigger Photoshop version (which contains all the font info) so you can play this fun game, it's here (5MB). Do please post links to your versions in the comments, and I'll grab 'em and put them here as well. Jumping in front of a train is a bad idea, for several reasons. First, it doesn't always work. Lots of people who try it survive. All of them Hurt a Lot. Some of them are sufficiently damaged that they are no longer capable of killing themselves and they Hurt For Ever. You don't want to be one of those people, you want to be a dead person! Second, consider the effect on the poor driver. Third, and most important, it disrupts the journeys of tens of thousands of other people, all of whom are your betters. That's just bad manners. As a public service, I would therefore like to suggest some ways in which you can kill yourself while causing minimum aggravation and inconvenience to worthwhile people. Park your car somewhere secluded and run a pipe from the exhaust into the passenger compartment. You will fall asleep and die painlessly. Sit in a nice warm bath and open some arteries. You will fall asleep and die painlessly. Take a sharp knife from your kitchen and stab yourself through the heart. Do this by placing the point of the blade between the appropriate ribs and pushing hard, do not attempt to stab from a distance. Hang yourself. The Interwebs will help you figure out how much of a drop you need for a quick death, but 9 feet will be adequate for all but small children. Anyway, the reason for this letter is that my journey home from work has been disrupted by inconsiderate suicidal bastards two days in a row now. This is not what I need after a day of being a useful member of society. Grrr. * you could argue that their window displays are winter displays, as they do also have spring, summer and autumn displays. As the middle of November approaches, we are reaching the time of year when it might just about be acceptable for shops to start Christmassing themselves up. So I'll only add truly egregious offenders from now on. 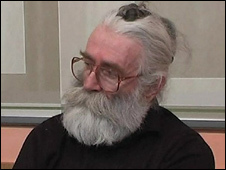 Mr. Radovan Karadzic might be an utter cad, but he does have a quite splendid beard and moustache. That's got to count for something. My old mattress, after ten years, had given up the ghost. Not only was it not supporting me properly any more, a spring had broken and was poking me with sharp bits of metal. So I went to Ikea's webshite and ordered a new one. I was told it would be delivered the next Tuesday. Fine. I made arrangements to work at home, and it didn't turn up. Not fine. I looked on their webshite again and found that it was instead going to be delivered a few days later on the Sunday. Fine. Early on the Sunday morning, I looked again to see what time I could expect it. The order had been cancelled. Not fine. So I phoned them. Apparently it was cancelled by their "payments team" because there was some problem with "verifying" my order. Not enough of a problem to stop them from charging my credit card though, as became apparent when they told me that I would be refunded. But I could order from them again, their idiot staff told me, and they were sure it would all work then. Yeah right. I needed something to sleep on now. The interweb found me Mattressman, who were cheaper than Ikea, and actually bothered to fulfil the order that they'd been paid for. I have asked Ikea for an explanation of what they were playing at and why I should ever consider shopping there again. Explanation I have received none. Nor do I expect to. So money they shall ever receive none either.